We offer creative, inventive ways to help you with the items that made your house into a home. FEATURE PAGE – WHAT IS A SWEET, ELDERLY LADY WORTH? LUMBERTON ESTATE/DOWNSIZING SALE WAS A SUCCESS, THANKS TO YOU! PHOTOS OF OUR WONDERFUL CUSTOMERS & CLIENTS FROM OUR ESTATE SALES! SALE CONTINUES: SOME ITEMS AT 1/2 PRICE! APRIL SALE NOW!!! A DIFFERENT SALE, “CALL OWNER, MAKE APPT.” TO SEE HIGH-END FURNITURE! THIS IS WHAT WE DO: BEFORE AND AFTER PICTURES OF AN ESTATE SALE! WHAT IS A SWEET, ELDERLY LADY WORTH? Let me apologize in advance because this is a rather negative post. However, it’s almost comical as to how some people justify things! It was the end of the last day of a three day sale and the last day is always 1/2 price day! Other than a couple of people who thought it was “fun” to haggle, all the customers seemed happy with 1/2 price day! We always close at 4:00 p.m. and about 3:45, this guy walks in the front door. Soon, I’m told that “this guy” (that will be his name), wanted to talk to me about pricing. I walk up to him. There are three decorative plates on the wall. They are marked $5.00 each, which makes them $2.50 each. I inform him that they are already half-price and they would total $7.50. This guy whines that he only wants to pay $5.00 for all three and if he can’t get them for that, he won’t buy them. He says this while walking away! Everything in me wanted to say, “You are seriously going to walk away over $2.50”? However, I bite my tongue, I’m tired, it’s almost over, so I say “Sure”. As we walk to the check-out table, “this guy” doesn’t say “thank you”, he says, “I’m buying them for a sweet, elderly lady who lives next door to me, I want to do something nice for her.” Oh really! So you want to be nice ONLY if I forfeit an already small profit Otherwise forget it? Clearly to “this guy”, she’s not worth an additional $2.50! I have a feeling that when “this guy” gives them to her, he’s going to tell her exactly how he haggled for them and how he refused to pay half-price but got the price down to less than that! In my mind, he ruined his “good deed”. Or maybe there isn’t a sweet little lady! Maybe they are on “this guy’s” wall! WHEN WE DON’T SEE YOU, WE MISS YOU! In this business, we make a lot of friends. We see our customers about once a month or every other month, depending on how busy we are and we get use to having you walk thru the estate sale door. We expect to see you. Often, at the end of a sale day, while closing up, our conversations usually go something like this; We haven’t seen the Burney’s or the Well’s. Hope they are okay. Where is Judy, Lisa or Linda? Well, Judy has to drive from Silsbee, maybe she just couldn’t make it. Jacqueline and J. D. haven’t been by, I remember she “liked” this, that or the other on our FB site. Where is George? He always comes on the first day. I hope he isn’t sick. Then there is always Fred! If he’s not at the front of the line, making people laugh, we wonder if he’s been in a wreck! I could go on and on with names. Mind you, we don’t usually have a long list of no shows. Just a sprinkling of names on any given sale day. Usually, everyone we’ve missed will show up before the end of the sale. If they don’t, then we really worry. There were several of our favorite customers we didn’t see at all during this last sale, thanks to Harvey so rudely interrupting their lives! We hope things are getting better for those who lost so much. We all need our safe haven from the world and when we’ve lost that, we are like birds without a nest. We also need our favorite chair back. The one we go to as soon as we get home, the one we sat in while kicking off our shoes, the one we nap in from time to time. I hope everyone who lost that chair, has a new one, along with a newly restored house or at least, one in the process of being newly restored. Why do we miss y’all? Is it because you spend money with us? Absolutely NOT! It’s because over the last couple of years or so, we’ve developed a relationship with you. We catch up with you, find out how things are going and what you are doing. When we can’t do that, we miss you. When you walk thru the door, we are happy to see you again. It’s just nice to go where everybody knows your name and that works for those on both sides of the check out table! IS IT OKAY TO HAGGLE OVER THE PRICE OF AN ITEM AT AN ESTATE SALE? First off, this article is directed at only a handful of our customers. A majority of our customers don’t ask for lower prices when shopping our estate sales. Thank you to those customers who honor our prices and even tell us, we have wonderful prices! Thank you for understanding this is a business. Since we have good prices to start with, I feel the days that have a percentage off make our prices a very fair deal. I think that TV is one of the culprits. Everyone loves to watch “American Pickers” and we see haggling on that show on everything the guys want. Remember, that’s a somewhat scripted show and they have to “stage” a bit of drama for ratings. The difference between us and American Pickers is that they own their business. We don’t own the items at our estate sales. We are working for a client and we have signed a contract that states the percentages off on Day 2 & Day 3. We don’t have a contract that says, “whatever the customer feels like paying”! This isn’t volunteer work, we are in it to make a profit, albeit a small profit sometimes. Our profit goes in several directions. After giving the client the largest percentage of the profit, paying the ladies and buying supplies, I sometimes walk away with very little and on a few occasions, nothing. We receive a lot of compliments on how nice and orderly our estate sales look. Customers love that everything is marked and they don’t have to guess at prices. We try to clean everything, even tools. Look around our sales, there is always a group of women in black aprons, ready to help you. Those ladies don’t work for free, I pay them by the hour. They have already worked many long hours before the sale even starts, making our estate sales look as good as they do. They have researched the items so they can mark the most reasonable price. We want our prices reasonable so If you are a vendor, you can resale and make a profit. If you aren’t a vendor and you are shopping for your home, you can take those items home, feeling like you’ve gotten a great deal! This isn’t a garage sale, it’s a liquidation of items so the client can then sell their home. In all my many years of going to estate sales, I’ve never haggled over a price. I treat it as though I’m in Dillard’s or Best Buy. When going to those stores, none of us throw money on the counter and say “I’ll give you this much for that!” Also, when we buy several items at a store, we don’t ask the clerk if she will take a little off the total, since we are such a good customer! So why do certain customers feel the need to haggle with us? Because for some reason, customers think we expect it. We don’t expect it and honestly, it’s a bit of bad manners. The last thing the person behind the counter wants to hear is that you want a lesser price on an already low price! We will continue to give you great prices, we will continue to honor our percentage off days and we will enjoy visiting with you while you shop with us. In return, I hope you will honor our prices. We have a business to run and a client to please. Thank you for shopping with Another Time, Another Place. We had something happen that was a wonderful surprise! 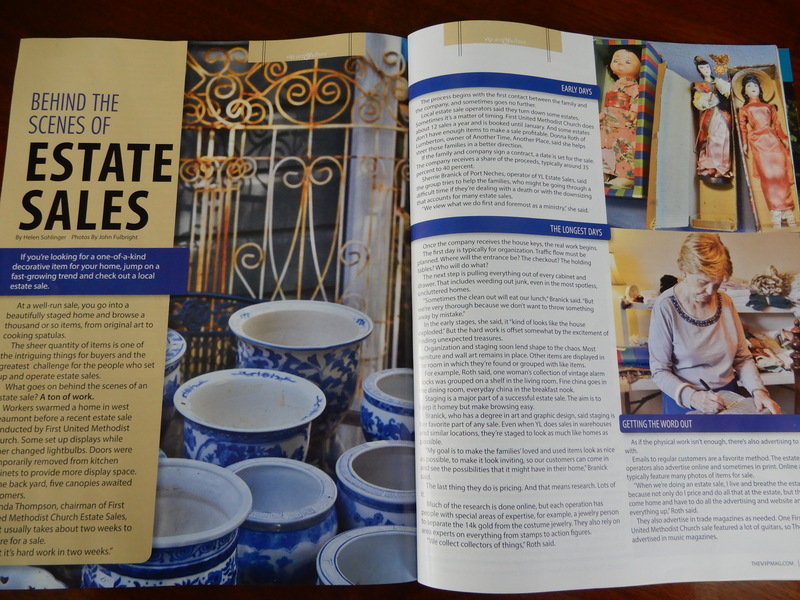 We were represented, along with two other local estate sale companies, in an article in the July 2017 issue of Beaumont VIP Magazine. The article is titled, “Behind the Scenes of Estate Sales” by Helen Sohlinger. It is a great article and spot on as to the workings of an estate sale. She included several quotes from our phone interview. Below is part of the article and a sampling of the quotes. We are very pleased with this bit of attention. We are very happy with how far we’ve come in just two years of being in business as ANOTHER TIME, ANOTHER PLACE ESTATE SALES. God has been great to us and kept us busy. In return and in thanksgiving, we strive to do the very best we can for our clients as well as our customers. We have met some wonderful people along the way and made lots of great memories and great friends. On a personal note, at the age of 62, (when I started this company) I finally figured out what I wanted to be when I grew up! It’s clear to me now that the things I’ve worked on in the past, were preparing me for this business. Praise be to God for this opportunity! Loving what I finally found is wonderful, but the cherry on top is that I get to do this work with close friends everyday! This is a service business and we are women who have a “serving, giving, helping”, kind of attitude in our daily lives. We now can serve clients during a tedious and stressful time in their lives. We try to make an emotional time for them, all better! We serve our customers by helping them find the right things that turn their houses into homes. Sometimes, they might be buying things to give to others, like clothes to go to Some Other Place. They may be buying something that gives them a happy memory of a time long ago, such as a vintage thermos like the one their dad always used or a jewelry box their mom kept on her dresser. We love to see their faces light up when they connect with an item. I’m feel fortunate to have found what I want to do when I grow up, at the age of 62!